In late May, I met a friend of mine and we decided to go sit on the beach . . . As soon as we saw the water we were in shock. For the past three years I have lived on the Chesapeake Bay right near Breezy Point Marina, and I had never seen so many horseshoe crabs. Even neighbors who have spent 50+ years in the neighborhood had never seen anything like it. 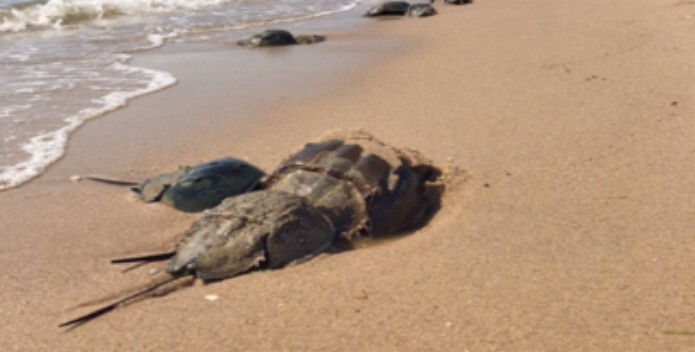 There were clumps of two to five horseshoe crabs mating. It was truly an awesome experience. The Chesapeake Bay is important to me for many reasons. The Bay provides food for families, careers for others, and a great place to live. My boyfriend has been mapping out stormwater sites all over the state of Maryland and that has helped clean up the water. I love being able to go out on a boat and catch a healthy dinner. I love being able to bring friends to my house and let them experience life on the Bay. I absolutely love living on the Chesapeake Bay. Ensure that Breanne and future generations continue to enjoy extraordinary places like these along the Chesapeake. Support the Chesapeake Clean Water Blueprint--the plan to Save the Bay! Horseshoe crabs near Breezy Point Marina.